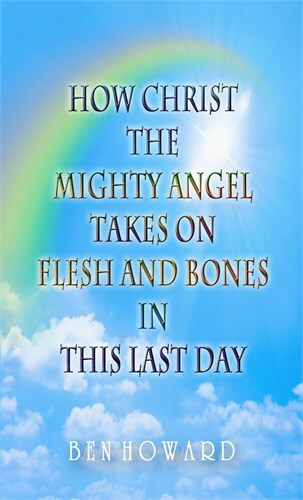 It was on October 11, 2009, I preached a message bringing the revelation of 'Christ, the Mighty Angel taking on flesh and bones in this last day,' taking the thought from the Book of John, Chapter One, and Revelation, Chapter 10. When I speak of Christ and the Mighty Angel here, I'm not talking about Jesus our Lord, that we are going to meet in the air in a physical form, but I'm talking about His wife that has become bone of His bone, flesh of His flesh, and she is called by His name. Now the Mighty Angel comes down from heaven, and we see Him in the Spirit to begin with, but as we have come into Revelation 10:8-11 time-wise, we see John taking the little book, him being a 'type' of the wife of Christ. We see John begins to prophesy, showing what the wife of Christ is doing, and we (His wife) are given everything that was in the body that Jesus lived in when He was here in His earthly journey. That is what Revelation 10:8-11 is showing us; that we have come to the place where the spoken Word, as it was in other ages, has now become the living Word in us. In other words, it was spoken then, but it's the living Word now. That is the difference between spoken Word and living Word. So like Jesus, we have become the living Word of God. The prophets in the Old Testament had the spoken Word and they spoke the Word of God. Now we don't just speak the Word of God, but we are the living Word of God. Again, this is what Revelation 10:8-11 is all about. We will meet Jesus Christ in the air, as the living Word. Yes, He will be in a visible body to us His wife. Now prior to this, He comes back in the Spirit (Mighty Angel) as a body to be baptized into before the rapture. We are baptized into that body and become the visible body of the Mighty Angel in the earth. That's Christ and His wife as we have become one; the spiritual marriage is now complete. He is that Word that was with the Father and so are we. That is the fullness of the man Christ Jesus (Ephesians 4:13-16). Now how does Christ take on human flesh? He sends the Spirit of the Word, which is His spiritual body; the very Spirit of Christ comes down in angelical form. It's the spiritual body for us to be baptized into. Being baptized into the body of Christ is not only having received the Holy Ghost, but is a furtherance of God's plan. There are those who are baptized with the Holy Ghost (foolish virgins/tribulation saints), but are not baptized into the body of Christ. (Read the book, Baptized with the Holy Ghost and Then into the Body of Christ .) Being baptized into the body of Christ means you have given yourself solely to the Lord, being married to Him. You are one with Him. In John 1:1, we read,"In the beginning was the Word, and the Word was with God, and the Word was God." Verse 14, "And the Word was made flesh," that means the Word was something else other than flesh. The Word was Spirit, but it had to take on flesh and bones. What you are seeing in this hour is the Word taking on flesh and bones - bone of His bone, flesh of His flesh, and Word of His Word, Spirit of His Spirit. That is why He can put His very own mind in us, and we cannot function well in this body of Christ without the mind of Christ. He gives us His mind, His attributes, and the very blood of Christ flows through your veins when you are baptized into that body of Christ. Now I am not talking about the chemistry of the blood here - let me explain the difference. The very blood of Jesus Christ flows through your veins if we walk in the light as He is in the light, the blood of Jesus Christ cleanseth us from all sins. That chemistry of the blood paid the price. The Bible says, "He offered one sacrifice;" He perfected us forever. (Hebrews 10:14) So the blood (chemistry) flowed out of His veins and went into the earth, but the life that was in the blood came back on the believer. The chemistry of the blood doesn't exist anymore, but the life of that blood is just as strong today. That is what happened when Jesus cried with a loud voice and gave up the Ghost. He gave up His Spirit (the Holy Ghost) - that is what came back on the Jewish Feast Day of Pentecost; that's the blood that cleanses your soul. There has never been any blood taken up to heaven; not in chemistry form, but only the life was taken up that was in the blood. That's what is in you. The blood of Jesus Christ flows through you (that spiritual man). The life of that blood flows right through you, not the chemistry of the blood. There was a life in that blood and that is what you receive when you repent of your sins. You are born again by the blood of Christ, not by the chemistry, but by the Spirit of the living God. That is why the Word says, "No man can come to God except the Spirit (of the blood) draws him," because the blood doesn't exist in any other form after the crucifixion. The life that was in that blood, what is it? It is eternal life. Otherwise we would have to have the chemistry of that blood with us today in order to live forever with eternal life. Jesus said, "I don't have to die." He had eternal life in Him which was the life of the blood, but He had to release it for you and me. When they came to get Him to be crucified He said, "I don't have to die. I could call twelve legions of angels." He could have destroyed all those men and saved Himself. But He said, "For this purpose came I into the world." Are you willing say, "For this purpose came I into the world to be a witness in this last day of these great things God is doing"? Are you willing to be a witness that Jesus Christ is still alive, that Jesus Christ has a physical body in the earth today and you've been baptized into it? That Mighty Angel has taken on flesh and bones. That's when we take the little book. That's when we eat the little book - we have tasted that the Lord is gracious. We eat the Word of God; not tear pages out of the Bible and eat it, but what we eat is the Spirit of the Word. I preached a message in Chitungwiza, Zimbabwe, in July entitled, Obtaining That Which Was Previously Unobtainable, because that which was previously unobtainable was sealed away in heaven with seven seals. The Lamb broke the seals and brought the little book to earth. Now we have it in our hands and are eating it because His bride has become His flesh and bones (wife). In Ephesians, Chapter 5, part of Verse 30 says, "For we are members of His body, of His flesh and of His bones." That means us. That doesn't just mean our soul. Our soul is never spoken of as flesh and bone. That soul is that inner person. Paul talks about the strengthening of the inner man, but this is talking about flesh and bones. We are bone of His bone and flesh of His flesh. It means we're His wife; we're part of Him. He came down and all that He has He shared with us, and we are heirs of God and joint heirs with Christ. .Please listen to audio, view the videos, or read the books below.